Thanksgiving Pumpkin Lasagna is an excellent vegetarian fall casserole. It also makes a beautiful presentation and is relatively easy to prepare. My good friend John emailed this recipe to me. At first I kind of wrinkled my nose... pumpkin? In lasagna? That didn't sound too appetizing, at least not to my "very-slowly-evolving-frugal-foodie" palate. Then, I thought... Hey, why not? I mean heck, I had pumpkin puree that I had frozen last year, and I really needed to use that stuff... I mean how long are you supposed to freeze pumpkin puree anyway? Probably not from one Thanksgiving to the next, but we'll pretend it wasn't that long! 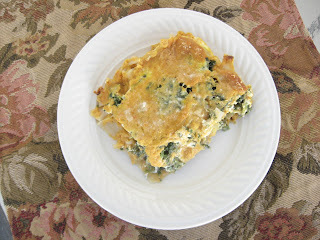 The recipe also called for spinach... and I'm all about some spinach, especially if I can find a way to get my picky husband to eat it. I'm also trying to incorporate more vegetarian meals into our weekly menu. I mean seriously, especially in our American diet, we could all use a couple more servings of vegetables a week! So we made John's Pumpkin Lasagna. Don't be intimidated by the long list of ingredients: You'll notice some of the same ingredients in the layer sections which I separated to make preparations easier. This lasagna is very good. I think next time I may even add curry powder to the pumpkin to give it more "kick." I'm also tempted to simply cook fresh pumpkin and use "fork-tender" pumpkin cubes in the casserole as opposed to mashed or pureed. If I were vegetarian, I think this would be a great main dish at Thanksgiving. Mary Frances or Sea, I'd love for you to give this a shot with your own personal variations and tell me what you think! Just one little hint... take your time in making this... as Monk would say, "You'll thank me later!" 1. In a large non-stick frying pan, heat oil over medium heat. Add onions and cook until translucent (about 5 minutes). 2. Add defrosted, drained spinach to onions. Add salt, pepper, sage, and nutmeg. Simmer until nearly all liquid from spinach has evaporated. Set aside. 3. Heat oven to 400 degrees. 4. In a medium bowl mix all ingredients for pumpkin layer together and set aside. 5. In a small bowl mix ricotta cheese and egg together and set aside. 6. Pour 1/4 cup milk into 9x11 baking dish. Top milk with 1/3 of GF lasagna noodles. Spread 1/2 of the pumpkin mixture on top of lasagna noodles. Top pumpkin mixture with 1/2 of spinach mixture. Top spinach mixture with 1/2 of ricotta mixture. Repeat layers. 7. Mix remaining pumpkin and cream together. Pour over top of lasagna. Sprinkle with remaining parmesan cheese. Cover with foil and bake for 25 minutes. Uncover and bake an additional 15 minutes until parmesan cheese topping is golden brown and talking to ya' (bubbling). 8. If you can possibly wait, let cool for 5-10 minutes. Stop salivating, plate up, and eat. Check back tomorrow for my gluten-free weekly menu! This week Karen, at Gluten-Free Sox, will be hosting! Carrie, that looks great. 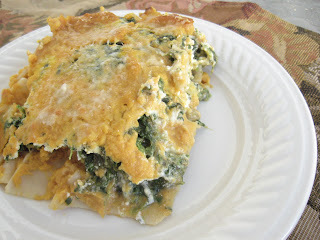 I love spinach and I have loads of Hubbard squash in the freezer, so we'll definitely be having this soon. I think I'll probably sub some tofu in for the cream, and use Fat Free Vegan's ricotta-like mixture for that later. I'm going to have to give the Parmesan some thought though. By the way, the polenta worked tonight. Thanks for the encouragement! Yum! I love vegetable lasagna so I'm sure I'd love this, too. It's so pretty, too! Ok! Pumpkin Lasagna is now on my "to make" list. :D Sounds delicious! I would love to see a dairy-free version of this...hopefully soy-free too...maybe with a pine-nut ricotta or white bean-based filling.